After a gap of two years, Stranger Things is returning for its third season, and it looks like the town of Hawkins is getting no respite. The new trailer for the third season has landed and it offers us a lot of hints and easter eggs about the premise, where and what the main characters are upto and what's the new threat that they will be facing. And yet the trailer doesn't show enough for a complete picture. Well played, creators Duffer Brothers! 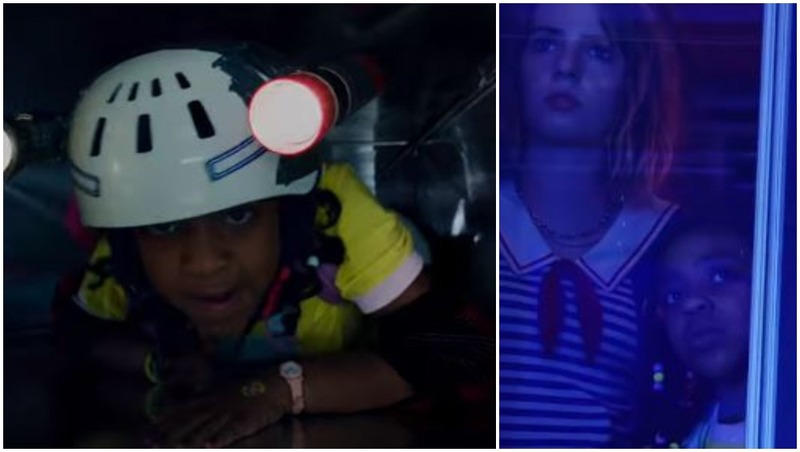 Stranger Things 3: The Kids Are All Grown Up but the Shadow Monster Is Still Being Petty and Hunting Them – Watch Video. So what's happening this time? Good news is that all the members of our favourite gang are returning. 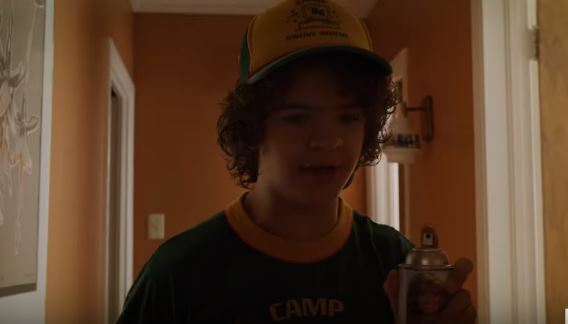 It is summer and Dustin (Gaten Matarazzo) has returned from camp to a 'terrifying' welcome. Eleven (Millie Bobby Brown) has grown her hair and is now friends with Max (Sadie Sink). Will (Noah Schnapp) has a new undisclosed reason to feel worried. The kids are going through teenage and their associated problems. Meanwhile, Chief Hopper (David Harbour) and Joyce Byers (Winona Ryder) continue to look morose. Our favourite babysitter, Steve Harrington (Joe Keery) is now working in a newly opened mall, Star-court, and he has a new friend for company in Robin (Maya Hawke, actors Uma Thurman and Ethan Hawke's daughter.) The sadist Billy (Dacre Montgomery) is a lifeguard at a swimming pool and he is still the cynosure of female attention. Meanwhile, Nancy (Natalia Dyer) and Jonathan (Charlie Heaton) are working as reporters. There is a new mayor in town Kline (Cary Elwes) and there is also a new monster too. What's more, even the dangerous Upside Down is returning! Not to mention, the '80s setting! In the trailer, Dustin uses a spray to accidentally attack Lucas (Caleb McLaughlin). This happens to be the Farrah Fawcett hairspray that Steve recommended to Dustin in the last season. 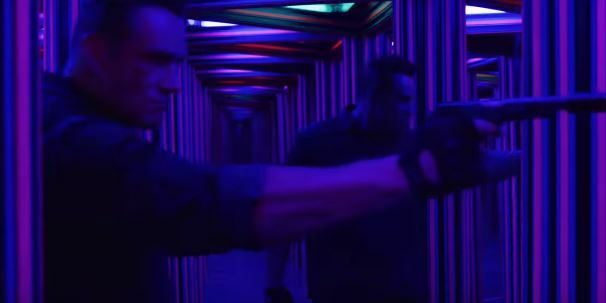 In a scene at what we think is the Hall of Mirrors placed in the fair scene in the trailer, a hitman is seen advancing trying to kill someone. This feels like a tribute to the first Terminator movie, where Arnold Schwarzenegger played the emotionless killing machine. 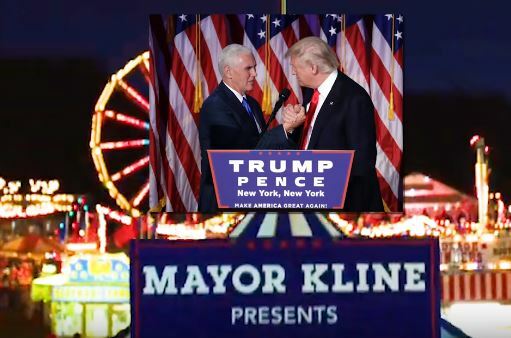 Mayor Kline, Hawkins' Donald Trump? The Princess Bride star Cary Elwes plays the new mayor of Hawkins, who doesn't seem to be very popular. This, despite, him being the factor that Hawkins has a new Starcourt mall. Stranger Things creators also put in a sneaky Donald Trump reference on him, as his and the US President's campaign posters have the same colour design. Also, the people of Hawkins seem to hate Kline. 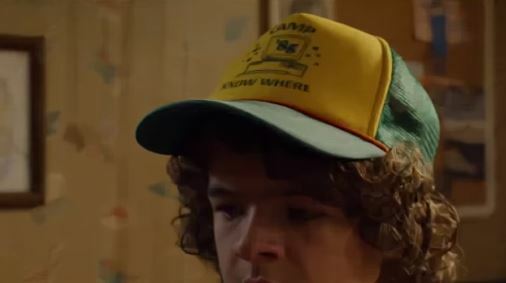 Dustin's summer camp is called Camp Know Where, which seems to a parody of Camp Nowhere, a 1994 movie. Also, his cap indicates that the year is 1985, which means only a few months have passed since the events of season 2. Even though it took nearly two years for the third season to get to us. Eleven and her obsession with Eggos continue in the third season. 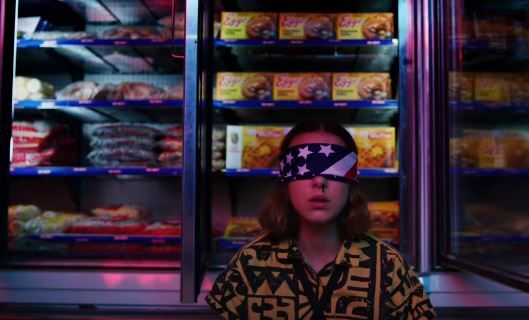 As seen in the above still where Eggo packets are placed behind a blindfolded Eleven. BTW, what's with the blindfold? Lucas' little sister Erica was a scene-stealer in season two and it looks like she has an expanded role in season 3. In a scene in the trailer, Erica is seen crawling through vents, which is an obvious reference to Bruce Willis's action movie, Die Hard. Erica is also seen in a blink-and-you-miss appearance when she is standing next to Robin, looking worried. Considering that Robin is in her work-clothes, this looks to be at the mall (where the final battle is said to be happening). 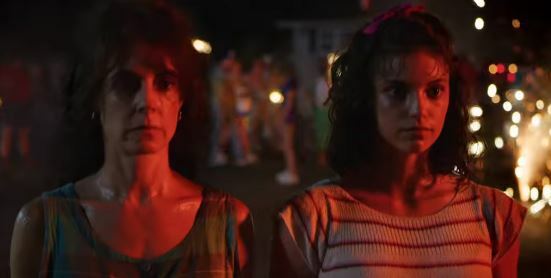 Looks like Karen Wheeler (Cara Buono), the mother of Nancy and Mike, will continue her unhealthy fascination for wild-boy Billy (as hinted in season 2) in season 3 too. The above pic says a lot! Speaking of Billy, he seems to be getting a more integral role in the third season rather than just being a psychotic douche as in the last season. In the above still, we see him getting injected with something that doesn't look anything nice. In another scene, we see Billy in the shower, and we see the below dark rash spreading on his hand. The above still doesn't bode well with the residents of Hawkins. Why are these women looking zombified? And they are not the only ones in trouble. The trailer offers a group shot of our young heroes, but Max is nowhere to be seen. We hope that she is ok. Also, why is Steve sporting a black eye? Did you spot any more Easter eggs or references that we missed out on? Share your thoughts and observations in the comments section below. 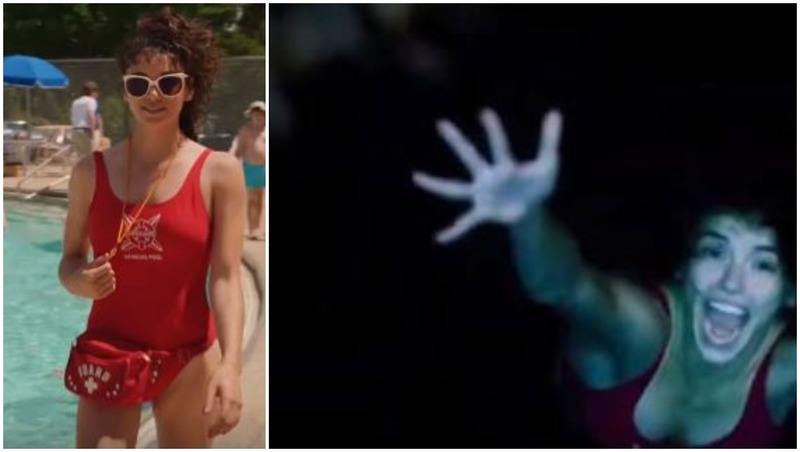 Stranger Things Season 3 will start streaming on Netflix from July 4, which is again referenced in the trailer.